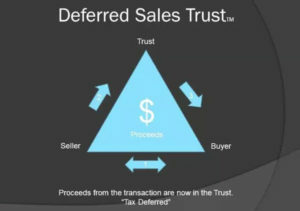 The Deferred Sales Trust is a legal contract between you and a third-party trust in which you sell real property, personal property or a business to the Deferred Sales Trust created for you. This is in exchange for the Deferred Sales Trust's contractual promise to pay you a certain amount over a predetermined future period of time in the form of an installment sale note or promissory note. It is often referred to as a “self-directed note” because you have control over the terms of the note. The Deferred Sales Trust gives you the ability to control your capital gains tax exposure, reinvestment terms of the sales proceeds, and installment payments made from the trust. The sales proceeds can be held in cash, reinvested and distributed according to the direction of the owner's installment contract. There are zero taxes to the trust on the sale, since the trust purchases the property from the owner for the same price for which it is sold. 9) A legal and tax cite package is available to a bona fide client or such client's legal or tax advisor with a signed NDA. I own a mobile home I purchased four months ago in a senior park. I am now moving to a new home and cannot rent out the recently purchased home out due to Park regulations. They do not allow rental properties. I anticipate selling the dwelling for around 60-65K. Would a Deferred Sales Trust allow me to sell this to a private party without paying capital gains? What are the costs to set up the trust? I have a Living Trust Ameriestate- could I use that? Patrick, at the price you indicate selling for, I wouldn’t estimate your taxes would be that severe and do not think the offset between the cost to create the DST vs what you would save would be altogether significant. Typically the DST is ideally positioned for a Seller who is facing a gain of $250,000 or more. You didn’t say if you also owned the land under your unit, if so you may qualify for a capital gains exclusion of up to $250,000 when you sell, which would make the sale tax free. I would talk to your CPA.